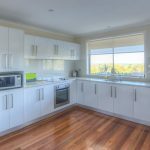 Newly renovated open plan living, dining and kitchen area taking full advantage of the ocean views. Slide open the balcony door and enjoy a wonderful BBQ with water views. Bedroom 1 – Upstairs – Queen Bed with slide door access to balcony. Bedroom 2 – Upstairs – Queen Bed with slide door access to balcony. Bedroom 3 – Downstairs – Bunk bed (double on bottom single on top) plus another single bunk bed. The NEW kitchen is well appointed, microwave, stove/oven and a large 520 Litre Stainless Steel fridge. The laundry is downstairs with a washing machine, iron and ironing board and a second bathroom downstairs. Large backyard, an outside shower to wash yourself down after a swim and ample parking for your boat and trailer.